Pros, educators, and drum fans everywhere agree—Roland’s V-Drums are second to none in the world of electronic percussion. They sound great, they’re built to last, and they feel great to play, with a musical response that fully supports authentic acoustic playing techniques. Now, the newest member of the respected V-Drums family has substantially raised the bar for entry-level drum sets. Offering true V-Drums quality at an incredible price, the TD-1K brings an all-new level of playability and performance to beginning players, students, and home-based drummers everywhere. Compact and affordable, the TD-1K V-Drums set is perfect for first-time drummers, practicing students, and anyone who wants to have fun playing drums at home. It’s also a great choice for drum teachers and other music educators, as well as experienced players and home studio owners looking for a quality electronic kit that won’t break the bank. Roland TD-1K V-Drums with optional PM-03 Personal Drum Monitor, TDM-3 V-Drums Mat, and drum throne. 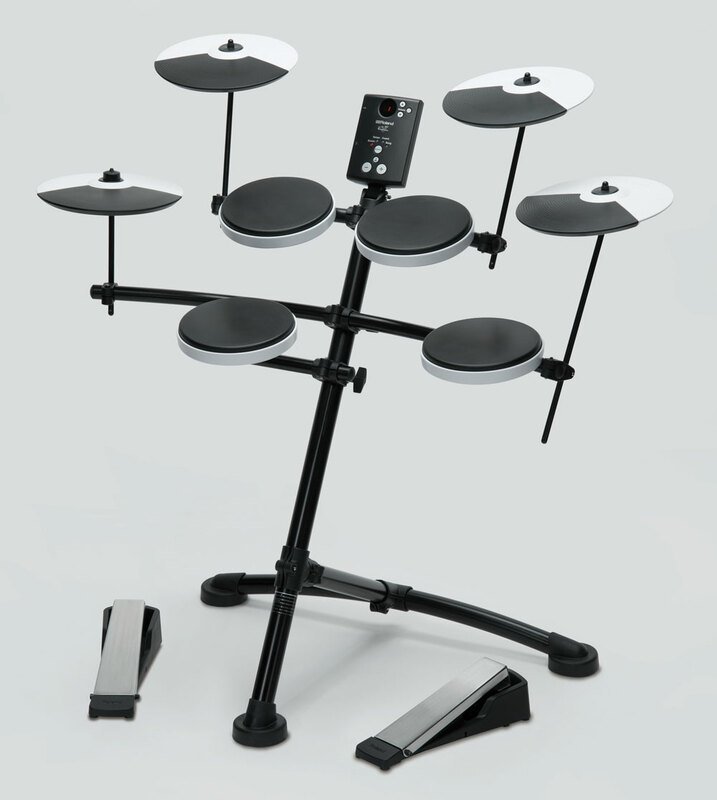 The TD-1K provides developing players a solid foundation for learning to play the right way and includes many built-in learning features for self-guided practice. Quiet performance is essential for home drumming, and one of the largest benefits that electronic drums bring over their acoustic counterparts. Built specifically for this application, the TD-1K’s low-noise pads/pedals and headphone monitoring let you rock out for hours without bothering others. The pad setup in the TD-1K includes a snare, three toms, crash and ride cymbals, and a hi-hat with a control pedal. 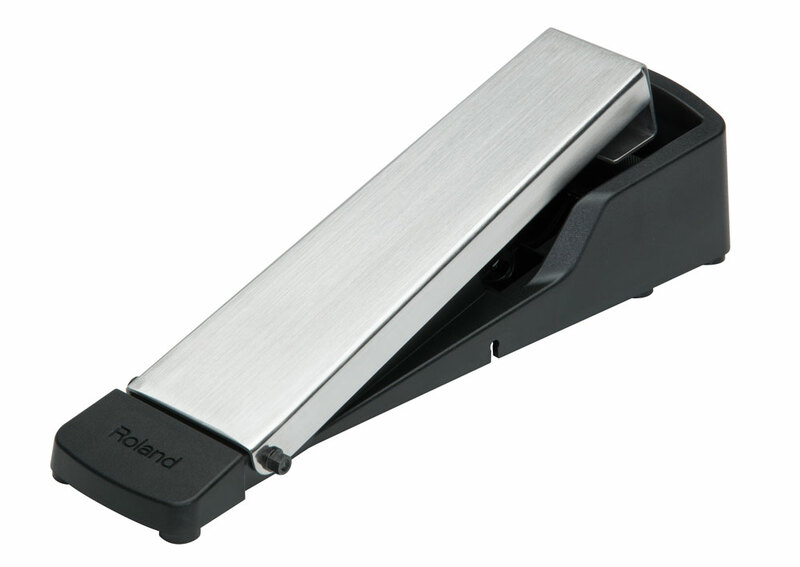 The kick pedal features an all-in-one, beater-free design that provides far quieter performance in the playing room than a traditional pad/pedal combo. With its stylish and practical design, the TD-1K fits into tight living spaces like apartments, bedrooms, and other places where a larger kit would be impractical or simply unusable. The sturdy, ergonomic drum rack can be adjusted with just three knobs, making it easy to set the drum positions for everyone from young kids to adults. The kick pedal included with the TD-1K V-Drums features an all-in-one design and very quiet operation. The TD-1K is equipped with 15 ready-to-go drum kits for playing nearly any style, from rock, blues, and jazz to world music and EDM. Every drum sound offers a wide dynamic range and natural tone, and the pads provide the organic response that V-Drums are known for. Unlike other entry-level sets, the TD-1K’s cymbals feature the advanced expressiveness that’s part of the entire V-Drums line. Just like acoustic cymbals, the crash and ride pads have a natural swinging motion when played. Additionally, they include separate bow and edge sounds, and support sound muting (cymbal chokes) when grabbed with your hand. The hi-hat also offers remarkable response with natural sound variations from tightly closed to fully open, and it’s even possible to play heel splashes with the ultra-responsive hi-hat control pedal. The TD-1K’s cymbals support cymbal chokes and have a natural swinging motion when played. Think electronic drums are hard to use? Not so with the TD-1K. The sound module’s intuitive interface is dead simple to use, even for beginners or first-time users of electronic drums. The panel provides a clear layout for accessing all functions easily, and the large value buttons can even be pressed with drumsticks, so you can change drum kits and adjust other parameters without missing a beat. The TD-1K V-Drums sound module is straightforward and easy to operate. Built right into the sound module is a range of functions that support learning and make practice sessions more effective. The metronome is always available for a timing reference, while the powerful Coach mode provides a fun set of exercises for building speed, stamina, and accuracy. The sound module also includes internal audio songs with all instruments except the drum part, letting you experience the feel of jamming with a complete band. You can also connect your smartphone or music player to the convenient Aux In jack and rock along with your favorite songs. The module even includes a quick-access recording function, so you can capture your playing at any time to listen back and check your progress. 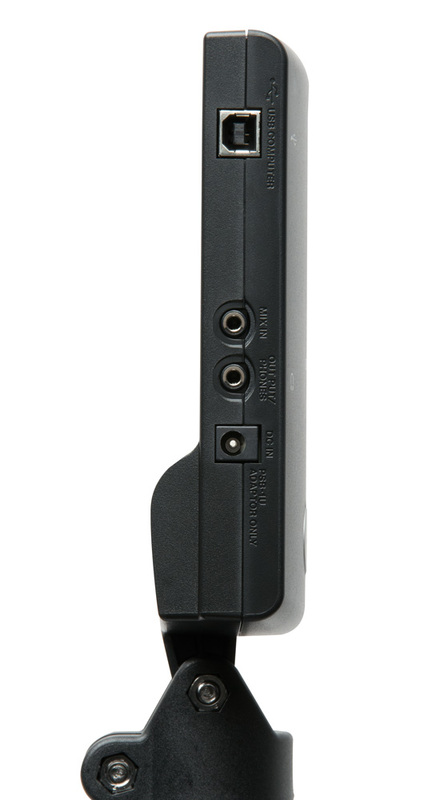 The TD-1K’s sound module includes a built-in USB-MIDI interface, making it simple to communicate with computer software via just a USB cable, with no extra hardware needed. Roland’s free V-Drums Friend Jam applications offer jam tracks, practice features, and the ability to share your drumming progress with other V-Drums users around the world. For more in-depth education, the powerful DT-1 V-Drums Tutor provides a fun, dynamic user interface for learning notation and developing essential drum techniques. USB-MIDI also offers a great way to use the TD-1K to capture realistic MIDI drum tracks in DAW recording software. USB and audio connectivity on the TD-1K V-Drums sound module. 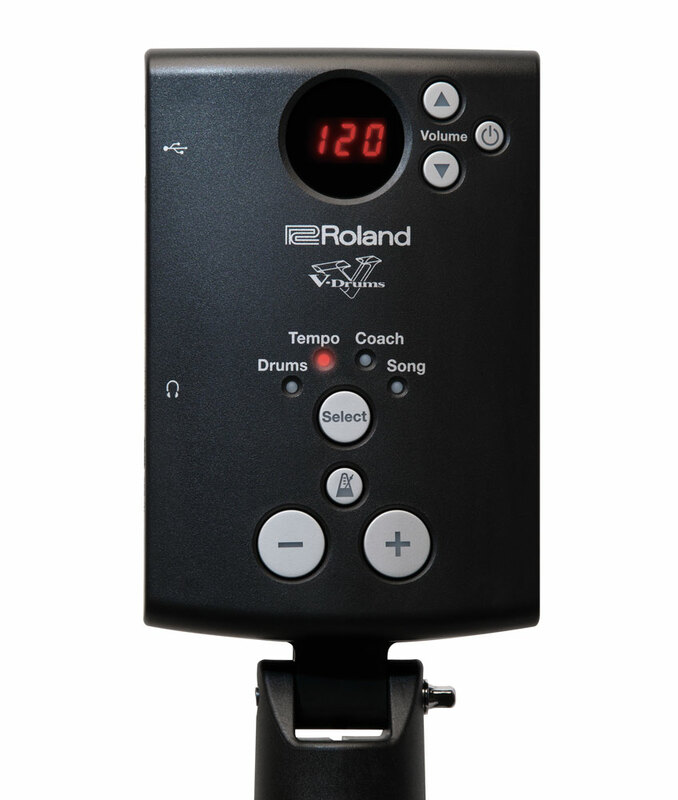 Roland offers a number of great accessories to enhance your TD-1K as your drumming talents grow. An additional crash cymbal can be added with the OP-TD1C Cymbal Set, and the kick pedal can be swapped out for a KT-10 or KD-9 used in Roland’s more advanced V-Drums kits. Other available accessories include the NE-10 Noise Eater, TDM-3 V-Drums Mat, and the PM-03 Personal Drum Monitor. TD-1K V-Drums with optional OP-TD1C Cymbal Set. Learn more about the TD-1K V-Drums at RolandUS.com. Nice looking, innovative design! I like 3rd crash option, so much missing on my TD-4KP! Can we see more information about module spec, predefined drum sets etc. ?